Deep green blue glass smoking pipe, pipes for Marijuana with free gift. Home > Shop > Green blue black dots glass smoking weed pipe. 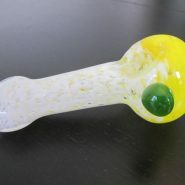 Green blue black dots glass smoking weed pipe. Handmade deep green blue color solid glass weed smoking pipe, 4" long. free gift on sale! There are really only 3 ways to smoke glass pipes for tobacco: cigarettes, cigars, and the pipes.